Socrates was a great thinker and an acclaimed teacher. He employed an interesting teaching method. He got his students to think by asking them insightful questions. It taught them important lessons while stimulating critical thinking. Great writers and leaders have used questions to illustrate and persuade down through the centuries. Properly framed questions are far more persuasive than statements. They force listeners to think and to come to their own conclusions. Perhaps someone can get this message to Kellyanne. President Trump is a very effective communicator. He would be even more effective if he teed up more of his points with critical questions. Instead of simply calling it a partisan witch hunt, he might ask questions. Mr. Mueller, how did you wind up with so many partisan democrats on your team? Would you allow people who had such clear points of view to serve on a jury? How can you expect the American people to believe that this is a fair investigation? If this is really about foreign influence in our election, are you looking into the role that former Russian intelligence operatives played in the creation of the discredited dossier? Who authorized and paid for that dossier, the one that launched this investigation? And what about the king sized speaking fees and donations to a foundation that benefited one family so handsomely? 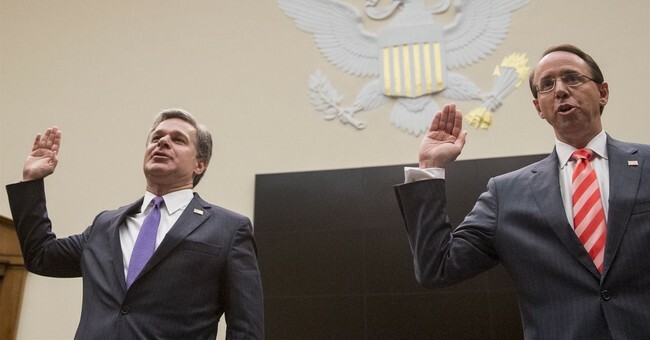 Mr. Rosenstein and Mr. Wray, why do you continue to slow walk the production of subpoenaed documents? Why is it that each drip of the next memo or text paints an even uglier picture of bias and abuse at the highest levels of your agencies? If your real objectives are to get to the truth and rebuild of the trust of these once proud agencies, shouldn’t you be eager to cooperate with the Congressional Committees? Do you understand why a growing majority believe that you’re hiding something? The President doesn’t have to answer the questions. They do. If they don’t, the point is made. Of course, they can’t answer them. At least, they can’t answer truthfully. Almost all great matters can be reduced to a few simple, basic questions. Recently, one of our favorite Congressmen, Chairman Devin Nunes boiled the entire collusion scandal down to the central question: Who really colluded? Was it the Trump team? Or was it a small band of angry partisans who abused their positions inside the FBI and DOJ, colluding to help one candidate and to smear the other, who they clearly detested? Those questions need to be repeated again and again. Repeated by our Congressional Leaders and those who hope to be. By back benchers and the vast nation of deplorables. Americans who believe as the founders did that certain things were worth fighting for. Will we become the timid subjects of an imperial deep state? Or will we hold people accountable and demand a return to the rule of law? A handful of investigative journalists and Members of Congress have been doing an amazing job of getting us answers. Were it not for patriots led by Chairman Nunes, Kimberley Strassel, John Solomon and the team assembled by Sean Hannity we wouldn’t know what we do today. But, they can’t do it alone. The stakes are surely high. But not nearly as high as those faced by our founders.